In 2012 KAMERS decided that, instead of spending a large amount on plastic bags to hand out at the event entrances and visitors having to throw it away afterwards, we wanted to direct those funds to a worthy cause. We were celebrating women, so supporting Reach For Recovery‘s breast cancer support work was a natural choice. This year we are proudly supporting the Women’s Hope Education and Training Trust (WHEAT Trust) with a percentage of ticket sales, as well as profits from the beautiful shopper bags Breytenbach Centre’s sewing project is making for us. WHEAT Trust envisages a Southern Africa where all women enjoy their human rights and have access to education, training and sustainable incomes, made possible by promoting a culture of giving. They have 14 years’ history of investing in women and developing women’s leadership. Since 1998, WHEAT Trust has been making small grants to grassroots women-led organisations that work in their communities to advance women’s rights. 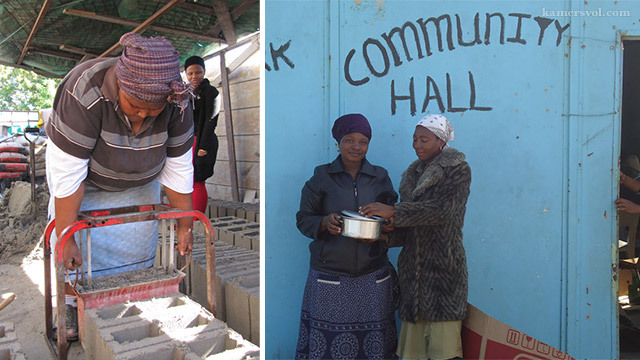 WHEAT Trust has provided capacity building, technical support and grants to more than 1200 women-led organisations in South Africa’s rural and peri-urban areas. As part of WHEAT Trust’s objectives to strengthen and sustain a new culture of giving, they mobilise local women and companies to invest in grassroots women-led organisations. WHEAT Trust supports networking and provides opportunities for women to share their experiences and learn from each other. They also organise regular capacity building opportunities where women can gain skills and capacity to manage their organisations. Be sure to support the wonderful work done by WHEAT Trust when you see them showcasing some of their projects at KAMERS 2013 in Bloemfontein 3-6 October, Stellenbosch 5-10 November and Irene, Pretoria 3-8 December. Tags: 1000 Women, bags, breast cancer support, community, community project, domestic violence, KAMERS 2013, shopping bag, tickets, video, WHEAT Trust, women's rights. Bookmark the permalink.